When the Australian people voted in last year’s federal election, most of them did not vote for the Greens nor did they endorse a Coalition government involving the Greens. But that’s what they got. In the vote for the House of Representatives, where government is decided, 94 per cent of the adult population voted and 88 per cent of their collective primary vote went to parties other than the Greens. 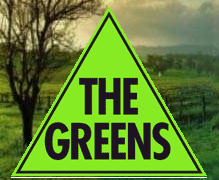 Yet in the ensuing 15 months all the big policy shifts by the Gillard government – none of which was put to the electorate – have been towards core policies of the Greens. The Prime Minister said no to a carbon tax. We have a carbon tax. She said no to open borders. We have de facto open borders. She said no to gay marriage. Support for gay marriage is now Labor Party policy. She put off indefinitely any substance of an emissions trading scheme. The machinery for such a scheme has been legislated. She said little about giving trade unions sweeping new rights. The unions are now acting on sweeping new rights. Yet another brick in the Green wall was put in place this week when Gillard and her cabinet made a mockery of the tender process, reversed itself again, and wasted millions of dollars again, giving the running of the Australia Network to the ABC, indefinitely. The Greens, utterly wedded to big government, wanted this tax-funded Australian overseas TV network to be part of the ABC. The Greens will propose legislation seeking to make this happen next year. It already has, effectively. The network will operate as part of the ABC despite losing the tender process to Sky News and despite the ABC’s dreadful 24-hour news network being grossly inferior to Sky News. Reader “Norm” in the comments points out that the SMH seems to “forget” that the Libs/Nats are also a coalition. What he forgets is that people know they’re voting for that coalition when they go to the polls. The Labor government were lucky to scrape in; and Australia certainly didn’t vote for the Greens. He won’t last. At least not with the smh. Reading between the lines … Ditch the Greens! mmmmmmmmm an Ralph good reference “not ” supporter of corporate 1% if there ever was one. Now how is it that the Australian economy is the best OECD economy atm. your last paragraph explained something which has long been a mystery to me. I know that K.Rudd gave the Free To Air Broadcasters in Australia $250m in the year before his demise but just how much fanatical loyalty does that buy you these days. At the end of last week I heard a piece on ABC radio national news that literally smacked me in the face. It went something like this. The Prime Minister of Norway has praised Australia for introducing a Price on Carbon and its efforts to combat climate change. PM Norway: I zink it is goot zat Australia has put a price on kahban. Zey ah dooing great work to combat climate change. ….that’s pretty much verbatim… straight out of Chapter One of the “Stalin Media Control Handbook.” And I’m not interested in Stalin because he was a ‘leftie’ I’m interested in him because he was stupid. Eventually the people in the USSR just learned to read between the lines of Pravda reports. The ABC is Australian Pravda, a state mouthpiece with a self styled progressive agenda which it is allowed to propagate so long as it mouths the words of the GreenLabor coalition, emphatically to the people. What is it about us…? Why do we assume that a National Broadcaster should have some ‘balance’…I think it’s got to do with Initials. We tend to trust a broadcaster that has always had the name of the country in question as part of its name. The British Broadcasting Company The BBC. Designed as a bastion of even- handedness. ABC, the Australian Broadcasting Company…that’s a big Name – and a big ask; gaining the trust of everyone on this continent, keeping the people of this continent informed about themselves, their fellow Australians and the rest of the world. Sure the ABC is and progressive, left leaning, arty, poofy, touchy, feely, spiritual, ethnic, quirky, funny sometimes, jingoistic others but it does a good job in the non urban areas keeping everybody in touch with the rest of humanity…..I have NO PROBLEM WITH ANY OF THAT because none of that effects me. But when the unfounded claims of a handful of ‘media scientists’ i.e. scientists who were adept at handling the media…when those now clearly baseless claims of Catastrophic Global Warming were made…there was something deep in the ABC that latched onto them…because they offered the dual thrill of ‘caring and control’. We care about you so…we’re going to control you. Never forget that Australia was once a Penal Colony. One could wildly imagine a study that discovered that the descendants of the original Warders, lock-keys, and screws make up a higher than average component of ABC staffers. So the ABC got the overseas network eh? That’s why they’ve been singing from the green labor hymnsheet. People hung cr*p on me big time when I predicted that despite the appearance of “different parties” in oz politics, the communist single party system with its insane stealth genocidial agenda would roll forward un-hindered. Pollies come and go and are eminiently interchangeable and disposable politically – if one wont do it, some other spinless clone will. Of course you cant tell the mug punters that they have a communist govt, lest they quake dowen the back of their couches, drop their TAB betting slip or miss Home and Away – and actually have to face up the fact we have stalinism now running rampant. This of course is too much – most people believe “it could never happen here” and switched off their brains “coz life is easy”. Well guess what – when you fall asleep at the wheel, the car crashes. Well, the only way to wake this dozy mug punters up is a huge jar of vass that the powers that be have in their hand ( and will use ) and a rather obscene and perverted glint in their eye.